A Road Map to Your Millenial Superhighway. Which demographic is going to be the biggest group of consumers in history? Did a job applicant really tell the interviewer there was no need to take their 'earbuds' out as they had adjusted the volume so they could hear the questions asked and the music on their iPod...? Are they really 'tech-savvy'... or just so tech-dependent they simply must know how to operate their technology? How do you manage a new employee who is starting at the bottom but only because they think their corner office is being redecorated? Gen Y, people born roughly between 1978 and 1994, are the biggest generation we have and we'll have them with us for a long time.They will live longer and spend more than previous generations and employing, managing and selling to them will require understanding just what it is Gen Y are all about. 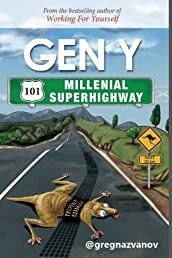 'Gen Y 101 - Millennial Route' is like your personal road-map to getting to know this vibrant, vital and often vexing generation.